"Not sure about the name but the dish is delicious. 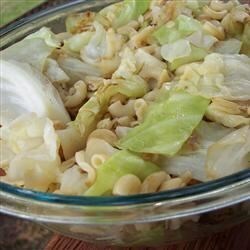 A simple dish of cabbage and noodles, but don't try to substitute butter, it's not as good. Try it with 1/2 pound of pastrami or corned beef cooked in." Bring a large pot of lightly salted water to a boil. Add farfalle pasta and cook for 8 to 10 minutes or until al dente; drain. In a large skillet over medium heat, saute cabbage in olive oil. If skillet gets dry add a bit more oil. Saute about 10 minutes then add cooked farfalle pasta. Reduce heat to low and cook, stirring occasionally, for about 20 minutes more. Sprinkle on pepper to taste. I grew up calling this Ukranian (or maybe Polish) dish "halushki", and it was made with bacon pieces and fried in bacon grease. It's fabulous this way! Bubbles & Squeak has cabbage, mashed potatoes, onions and lots of butter in it and is very delicious! I thought I'd give this recipe a try and it was very bland. I am SO glad I went ahead and took a chance on this one! Everyone was fussing. WHY? Turned out good to me. Thanks. Wish I would have read the reviews before trying this recipe! Really awful! This dish by itself was alright, adding mozzarella cheese and sausage made it quite tasty though!